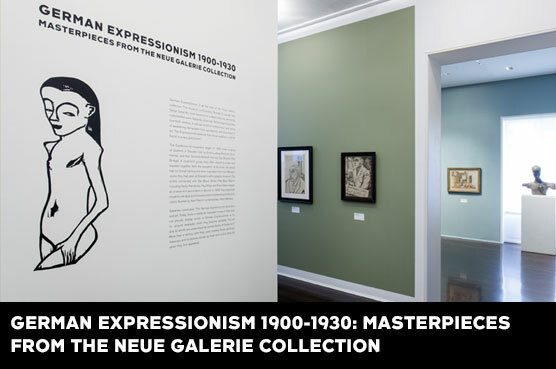 It was a pleasure to peruse the German Expressionism exhibit at the Neue Galerie, which highlights an artistic movement central to the institution's collection and showcases some of its most prized works. A few of these I have seen before under other circumstances, but a recontextualization such as this allows for new connections and fresh perspectives on even these familiar pieces. A selection of works in a variety of media inhabits the museum's uppermost floor, and serves as an introduction rather than an exhaustive study. The textual overview greeting visitors states in simple terms the innovatory nature of German Expressionism, and recognizes its use of primitivism to achieve a new aesthetic of modernity. The artistic group Die Brücke found inspiration in an ethnographic museum, and the text implies that "German Expressionism" is comprised of these artists—including Erich Heckel, Karl Schmidt-Rottluff, and Ernst Ludwig Kirchner—and those of the group Der Blaue Reiter—including Wassily Kandinsky, Gabriele Münter, August Macke, and Franz Marc. However the relationship between these two groups (if there was one) remains obscure, and the movement's full extent and influence undescribed. The last sentence of the description declares that the pieces these artists generated are as forceful today as they were when created. The lack of further text in the galleries (beyond the expected tombstone labels) permits the displayed works to stand alone, and therefore emphasizes their continued visual impact. However for those without an art historical background it might be helpful to provide some reference to their forerunners, such that the Expressionists' impact and innovation might be more fully grasped. Though powerful they are not pretty, at least not always. While you will find some charming prints, beautifully rendered figures, and wonderfully expressive colors, many of the works feature grisly palettes, uncomfortably emaciated figures, and graphic sexuality (a Google image search for "Otto Dix" gives you the sense). There are also delightful surprises, such as Paul Klee's 1909 watercolor self-portrait, a George Grosz ink and wash work of vivacious spontaneity, and an intoxicating 1908 Kandinsky painting entitled Murnau: Strasse mit Frauen to which I returned again and again (below). Wassily Kandinsky. Murnau: Street with Women/Murnau: Strasse mit Frauen, 1908. Oil on cardboard. This work is part of the collection of Estée Lauder and was made available through the generosity of Estée Lauder. © 2013 Artists Rights Society (ARS), New York / ADAGP, Paris. What impresses most in this exhibition is the sheer breadth of style that falls under the rubric of German Expressionism. This diversity is perhaps most evident in the hallway, which showcases a range of portraits. Because each depicts a similar subject in a highly individual way, this visual comparison very effectively highlights the artists' diversity of approaches. Note here Grosz's drawing of John Förste; his painting of the same man is found in the adjoining room. 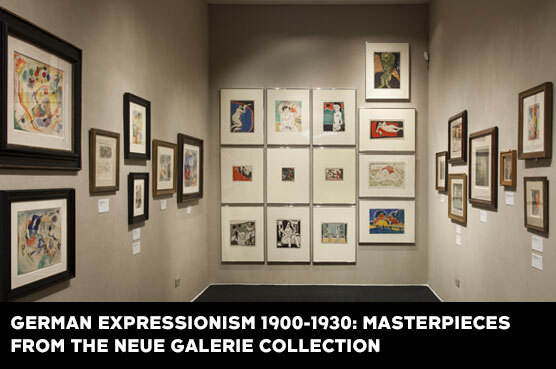 Other highlights include the prints displayed in the Neue's smallest gallery, which makes quite apparent the relationship between German Expressionism and primitive art. For example, I find that the horses in Franz Marc's The First Animals strongly recall the cave paintings of Lascaux (below). At left: Franz Marc, The First Animals, 1913. Gouache and pencil on paper. Right: Cave paintings, Lascaux, France. I enjoy the intimacy afforded by that particular space within the Neue, but I did have one complaint: closely-hung prints fill the wall across from the entryway (below), and the labels associated with these works are hung directly opposite, just inside the door. Consequently the viewer must turn his back to the prints in order to determine their maker, title, and date; a disorienting arrangement to say the least. And one final point of confusion: the Bauhaus works in the back gallery. Is this in fact part of the German Expressionism exhibit? Its presence afforded quite a surprise. I wonder if it is meant to serve as a benchmark of "modernity," and thus provide some of the context I felt was missing: a roughly contemporary manifestation of the modernity that the Expressionists were working with or against or around. That said, this gallery contains some wonderful pieces, including a selection of door handles, Marianne Brandt ashtrays, and a side by side display of a Breuer Wardrobe and a Schleifer Exhibition poster that very clearly demonstrates how the Bauhaus graphic aesthetic translated across media. Marianne Brandt. Ashtray, Weimar, ca. 1925. Brass and nickel-plated metal. Overall: 6.9 cm x 12 cm x 11 cm. There is much to see and appreciate here, and even more if you continue downstairs for the concurrent display of German and Austrian decorative art recently gifted to the institution by Harry C. Sigman. Here is a marvelous integrated presentation of the fine and decorative arts, a mission central both to the period of the works on display and to the stated mission of the Neue Galerie. Joseph Maria Olbrich. Two-branch candlestick, ca. 1901. Execution: Metallwarenfabrik Eduard Hueck, Lüdenscheid. Pewter. Gift of Harry C. Sigman. German Expressionism 1900-1930: Masterpieces from the Neue Galerie Collection and German and Austrian Decorative Arts from Jugendstil to the Bauhaus: The Harry C. Sigman Gift are on view through April 22, 2013. The Neue Galerie is located at 1048 Fifth Avenue at 86th Street. Open Thurs-Mon from 11am-6pm, general admission is $20, $10 for students and seniors (65 and over).On the first Friday of every month the museum is open to the public from 6-8pm.